In Alcaucin we’ll find several festivities, particularly highlighting the ones of San Sebastian, celebrated during the 20th of January, the Holy Week during which some of the locals dress up with masks. During the first days of September we’ll find another very popular celebration, during which the farmers light up bonfires that illuminate the night while the people enjoy the gastronomy and the typical wines of the area. This festivity has its origin in the burning of useless objects whilst they would chat, dance and have fun around the fire. One of its most popular celebrations is the Chestnut Day, where they share out over 300 kilos of chestnuts and sweet potatoes, typical Christmas sweets and anisette. This day hosts around 3000 visitors that make their way to the village of Alcaucin to enjoy this day and the star product of the municipality, the chestnut. If you wish to join the next celebration of the chestnut day, it’s held on the 30th of October from 7 pm onwards, the time from which they begin to roast the chestnuts. This festivity is celebrated during the last weekend of May and has a family atmosphere. It’s one of the celebrations that we have mentioned in the beginning of this article and that it is celebrated in the beginning of September (7th and 8th). During this festivity the people gather round the fire and burn objects that don’t have any value whilst they chat and dance. Every year, during the month of August, there is a flamenco festival held; the last one took place on the 6th of August at 11:30 pm. This fair generally begins on the first weekend of August and offers concerts of the municipal music band, flamenco dancing, daytime partying and several shows of singers and stand-up comedians. The beginning of this fair is between the 6th and the 8th of August. The Three Kings Parade takes place on the 5th of January and is an event during which the decorated thrones parade along the streets sharing out millions of sweets. 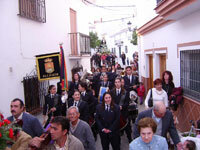 This religious celebration takes place on the nearest weekend to the 15th of May. The Holy Week (Semana Santa) is not only a religious celebration in Alcaucin, but also a gastronomic gathering where they eat sweets and typical dishes of the area. This Holy Week also has the peculiarity of a group of people that, dresses up with masks, go out on Thursday pestering the people until they invite them into a bar for a drink.